"The majority of the credit goes to Rinji of Bonus Level for making the art (obviously), and to Gileum of Skull Fortress Cosplay Page for a) contributing so many great ideas during its conceptualization, and b) designing the slick new Legends 20th anniversary logo seen in the bottom-right corner of the piece. Those two folks were a phenomenal combo, and they produced a piece which exceeded my highest expectations!" "I thought it would just be a good idea to kick off our Legends 20th-anniversary celebrations with something that really boosted the morale of our community, and reminded everyone why we're still fighting for a sequel to this series even after 17 years. To that end, I reached out to Rinji (whose Mega Man artwork had constantly amazed me in the past) through Gileum, and asked for assistance in creating an art piece that featured the Legends gang throwing one heck of a party!" Speaking of Get Me Off the Moon, the group will be launching several campaigns throughout 2018 to honor Mega Man Legends. What's more, they have a few exclusive interviews on the burner, too. Should be interesting. Happy 20th, blue boy! Hope to see you again someday! 17 years and i'm still waiting for legends 3. With the unexpected surprise announcement of MM11, I'm remaining optimistic for the future of the Legends series. I still have my original MML and MML2 disks. 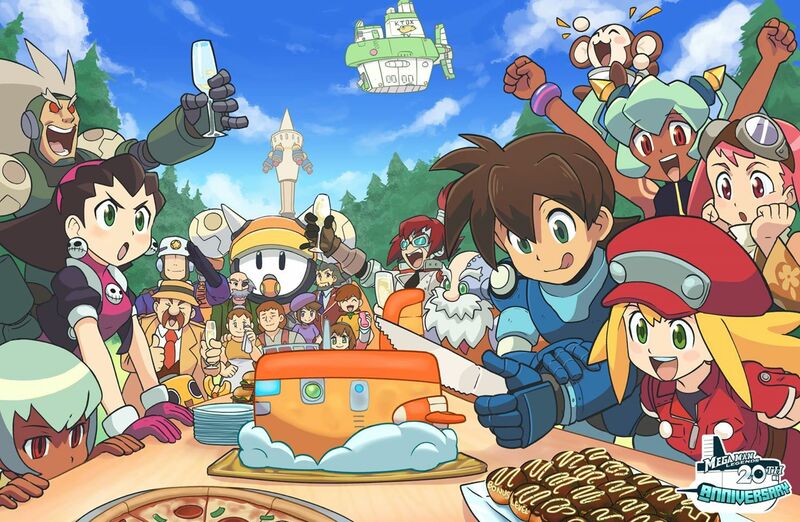 :) Congrats Mega Man Legends on 20 years of life in the hearts of the fans! As grateful as I am for MM11, MML3 and MMZX"3" are my most wanted Megaman sequels. I'm really hoping they become a reality some day! The Legends series is defined by it's turn-of-the-millennium game design. Sorry to say, but the PSX/N64 era was like the 3-D equivalent of the Atari 2600, most developers were more ambitious than knowledgeable about the technology and how to apply it. Sure plenty of people have fond nostalgic memories of those games, but as games like Yooka-Laylee have shown, they aren't quite as good as we remember and are probably better off relegated to history. So if a Legends 3 was ever actually made, everything would have to be overhauled and updated. Which is likely to upset and alienate purist fans who would wish for a sequel that plays in an identical fashion to the first two games. I don't know that that's an apt comparison. Collectathon platformers like Yooka-Laylee are pretty different from whatever Legends would be classified as. Not to say it wouldn't have some updates, but if the footage of the prototype was anything to go by I think they could have done a decent job of maintaining the feel of the original while making things more accessible for modern times. I often feel that people are more interested in Legends' story than its gameplay. I've never liked the tank controls of the Legends games, personally. I only toughed it out because I felt the story was so engaging, but I rarely ever go back to replay the Legends games because of how bad I think the controls are. So I typically just look up videos of the cutscenes on YouTube if I want to relive those games. Legends is one of the most epic and adventurous of the series to me. It gave me megaman as a an adventurer making friends. The hilarious Bonnes trying to get ahead but never can. I have played the first and completed it, just the beginning of the second,trying to finish it due busted psx. But to have Legends 3 would be a dream come true. That tribute animation is amazing.